The hard-working elves at the North Pole are energetically preparing for the coming holiday season and Mr. and Mrs. Claus are busy ramping up production in their workshop. It’s a season full of hustle and bustle, commotion and last minute tasks. The Reindeer Operations Division is also gearing up for a hectic time. Dasher, head of Reindeer Operations and apprentice Rudolph, have a wonderful gift-giving idea for those looking for something unique and different. And it will lessen the burden on his reindeer and save on fuel (food) costs. 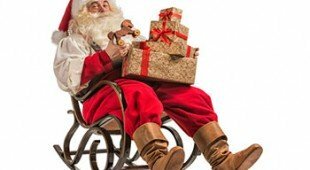 In conjunction with the North Pole representatives at Windsor Public Library, they have initiated a novel fund raising initiative which will see rocking chairs placed in various libraries. With a donation of $500, the library will purchase a rocking chair which can then be customized to memorialize or honour family members or friends. Charitable tax receipts will be issued for all donations. Rocking chairs are the perfect seating choice for library visitors – young and old – who want to read and relax. They impart a welcoming atmosphere and an invitation to enjoy reading. Santa’s Helpers are standing by at Windsor Public Library to answer any questions and provide more details about the opportunity. Dancer suggests you contact the North Pole Procurement Agent at the library (CEO Kitty Pope) at 519-255-6770. As a parting comment, Dasher confirms that his team appreciate carrots when they visit but never leave out chocolate – consumption can cause a delay in deliveries!